Civic Engagement Week is February 23 to 28, 2015! Civic Engagement is about demonstrating care for people, our communities, and the environment and place we share; it is working towards creating a better quality of life for all. Students can make a difference through community service, leadership, learning about social issues, and advocating for change. Join the Center for Civic Engagement for a series of events to build community, learn from local nonprofits, and to celebrate and appreciate what OSU students and local agencies are doing to better campus and our greater Corvallis community. Explore the many aspects of civic engagement and how you can make a difference! All Week, February 23-28: Celebrating and appreciating what the OSU community and local agencies are doing to improve the quality of life in the greater Corvallis area (chalking around campus, social media posts, etc.). This includes YOU sharing gratitude with those around you who are working for positive social change. If you want to use social media to share appreciation, please use the hashtag #OSUCEWeek2015. 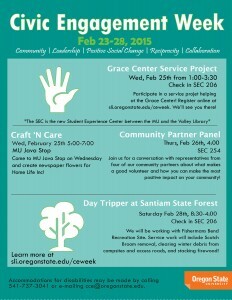 Learn more and register for projects here: http://sli.oregonstate.edu/ceweek. Accommodations related to ability may be made by calling 541-737-3041 or emailing cce@oregonstate.edu. Posted in Awareness, Events, Involvement.